Life of Siddhartha Gautama Buddha, the founder of Buddhism. Buddhist inspiration: Who was Gautama Buddha? Buddhism is the one world religion that everyone seems to respect. Many more people would like to call themselves Buddhists than actually are Buddhists by traditional counts. Buddha found the source of sorrow, what sorrow is and the way out of sorrow (or suffering). He has inspired millions around the world and in the West his teachings symbolize religion without belief. When a man dwells on the objects of sense, he creates an attraction for them; attraction develops into desire, and desire breeds anger. Why was Gautama Buddha Imporant? Prince Siddharta was born in Lumbini (in modern day Nepal), to the kshatriya caste of warrior-aristocrats. (The Indian caste system was also probably somewhat more informal at this time than it later became). He was the heir to the position of "prince" ("village chieftain" may be more accurate) of the Shakya clan's village of Kapilavatthu or Kapilvastu in the foothills of the Himalayas in what is now Nepal. Siddharta married and had a son: Rahula, but at age 29, around 534 BC, having become increasingly dissatisfied with the contrast between a life of aristocratic luxury and the suffering he observed endemic in all people, Siddharta abandoned his inheritance and palace and began living an ascetic life, training with ascetic philosophers, and practicing austere meditative practices. The Buddha emphasized that he was not a god nor the messenger of a god and that Enlightenment was not the result of a supernatural process or agency, but rather the result of a close attention to the nature of the human mind which could be rediscovered by anyone for themselves. For the remaining 45 years of his life, he traveled the Gangetic Plain of central India (region of the Ganges/Ganga river and its tributaries), teaching his meditation practice to an extremely diverse range of people, from nobles to street sweepers, and including many adherents of rival philosophies and religions. He founded the community of Buddhist monks and nuns (the Sangha) to continue the teachings after his death (considered to be the paranirvana or complete ending of the Buddha). 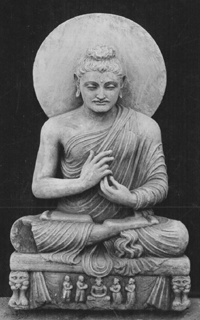 After intermittent illness, the Buddha died at Kusinara (now Kusinagar, India) at the age of 80. His last meal was sukara-maddava which he had received as an offering from a smith. The correct translation of this term is unknown; sukara means "pig", maddava apparently means something like "delicacy". Sukara-maddava may mean "tender pork" or "mushrooms or tubers enjoyed by pigs". Vegetarianism is for Buddhists an ideal rather than a mandate, and monks and nuns in particular are enjoined to accept all offerings of food made to them (unless they know an animal has been killed especially to feed them). One account gives the Buddha's last words as: "All things which are made of parts eventually come apart. Be mindful, and achieve Enlightenment! ", while another gives, "Subject to change are all things. Strive on with diligence." Do not speak harshly to any one; those who are spoken to will answer thee in the same way. Angry speech is painful: blows for blows will touch thee. Gautama Siddharta was reported to have been athletic and fit throughout his life, competent in martial arts such as chariot combat, wrestling, and archery, and later easily hiking miles each day and camping in the wilderness. Images of a fat "Jolly Buddha" or Laughing Buddha are actually depictions of the future Buddha, currently Bodhisattva Maitreya. Birth of Gautama Buddha, the founder of Buddhism. Gautama Buddha: his conception and birth at Lumbini, India. Gautama Buddha: his birth, youth and enlightenment. Jesus and Buddha are both said to have walked on water, they share a miracle! a murderer called Angulimala or "Thumb Necklace." Toward the end of hislife, the Buddha took his disciples to a quiet pond for instruction. Asthey had done so many times before, the Buddha’s followers sat in asmall circle around him, and waited for the teaching.But this time the Buddha had no words. The Dhammapada (or Dharmapada) is an old Buddhist book of sayings. It is not clear whether they are actual sayings of the Buddha himself, as the text isn't part of the Pali Canon. On the other hand, the text has been found in both Theravada and Mahayana sources so it is common to all traditions of Buddhism. 3. Abhidhamma Pitaka, variously described as philosophy, psychology, metaphysics etc. Together these three are called the Tipitaka. According to scholars the Pali Canon is a mixture of material going back to the Buddha and material by his disciples. The earliest versions we know historical facts about date to the fifth century C.E. The last life before he reincarnated as prins Siddharta, the future buddha was a king who gave away even his wife. 1) The picture of Buddha as given above is from Digibeeld an online database maintained by Kern Institute, University Leiden, The Netherlands. Shahr-i-Bahlol is an archaeological site in Gandhara (Northern Pakistan). Ellen Raven (teacher of Buddhist art at Leiden University) estimates that it dates from the third century A.D.
DigiBeeld nr. 14842; This picture was made in 1906 of 1907. Buddha from Shahr-i-Bahlol. ; Celloidin paper, toned (DCZ); Kern Institute, Leiden University. Free of rights. The date for the Buddha's birth is contested. Classic sources still put it at around 563 B.C. but many maintain his life should be placed in the fourth century B.C.